Here's one of the reasons I love owning Passionflower. Every now and then someone on the staff comes to me and says....."someone was in the store and they brought in all these hair clips that they make and they're really cute , and she has hundreds of them."..... "Hundreds of them ? "...that sounds like fun. 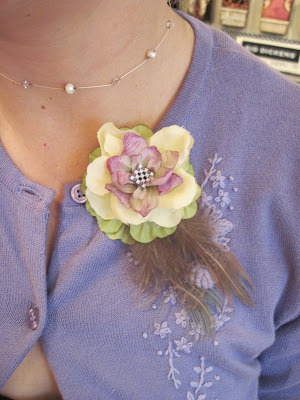 And it WAS fun when South Eugene High School sophomore Anna Carlson brought in her hair clips which she makes from silk flowers she buys at Value Village, takes apart and refashions adding buttons, tulle, and feathers and bits of this and that. There were lots to choose from and Ms. Carlson seemed pretty happy to leave with a check for a couple of hundred dollars. We were both pretty happy. And then Wendy made them look really cute with ribbon and a sign. More happiness. And then Alison made them look even cuter! "Viva las Flores de Cuerpo"